Says Elizabeth Warren has a racist figurine in her kitchen. By Ciara O'Rourke on Friday, January 18th, 2019 at 3:41 p.m.
A viral image suggested that Elizabeth Warren displays a racist figurine in her kitchen. We rated this claim Pants on Fire! After Elizabeth Warren did a live Q&A on Instagram on New Year’s Eve, many news outlets focused on the beer she sipped in front of the camera. But other viewers were more intrigued by the art decorating her kitchen cabinet. "Racist much?" says a Jan. 16 Facebook post on the New York City Republicans page that shows a photo of Warren in front of the cabinet alongside a figurine of an offensive caricature of a black boy eating a watermelon. One of the pieces on her cabinet is circled in yellow, suggesting that it’s the racist art in question. The post was flagged as part of Facebook’s efforts to combat false news and misinformation on its News Feed. (Read more about our partnership with Facebook.) 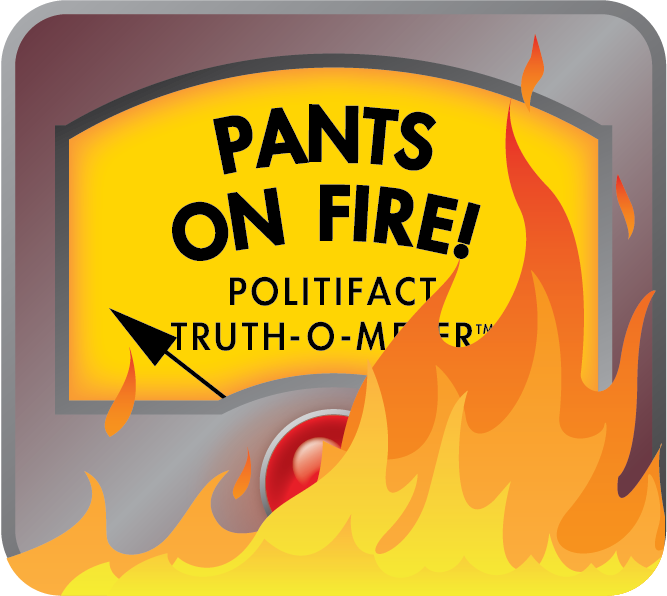 A message PolitiFact sent to the New York City Republicans Facebook account about the image was not immediately answered. However, the pictures appeared online elsewhere more than week earlier. "Does Elizabeth Warren have blackface statues in her home!??" asks one Jan. 4 post on Reddit. That same day, Tomi Lahren, a Fox News contributor, tweeted a similar picture (that has since been deleted). "Am I seeing this correctly?" she said. Not according to Warren. Her campaign posted two photos of her kitchen cabinet from different angles that show the figurine is actually a vase, and not one with racist overtones. On Jan. 31, the New York City Republicans responded to PolitiFact's message about the post and said it had been pulled. "It was apparently posted by Tomi Lahren on Twitter," the group said in a Facebook message, "and one of the administrators of this page posted it. We removed it after we found out it was not true!" Published: Friday, January 18th, 2019 at 3:41 p.m.